Today The Times has a leader, Ecumenism rebuffed. …In the interests of his own authority and the integrity of the Anglican tradition, he should give the pontiff two clear messages. The Church Times website has an update to the printed version, Archbishop takes the argument to Rome by Paul Handley. Andrew Brown wrote Graphic confusion in Rome at Cif belief yesterday. 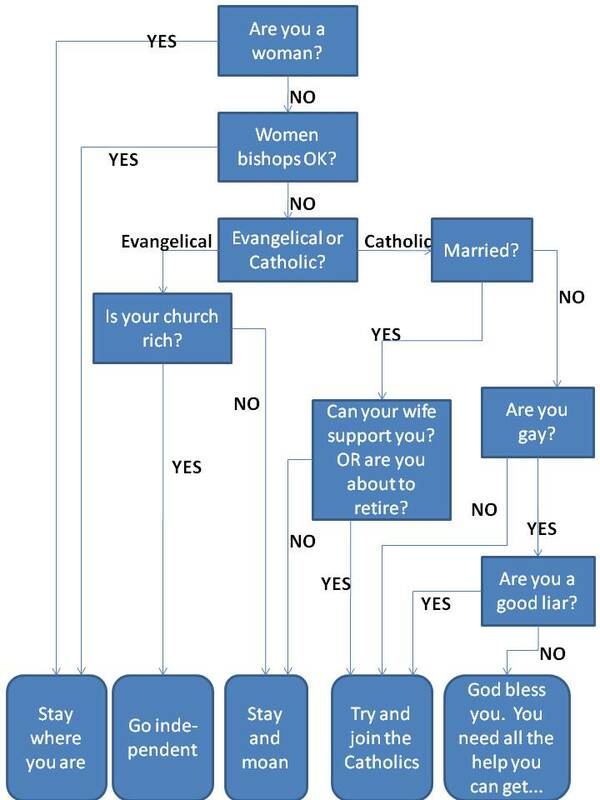 He links to this helpful flow chart from The Beaker Folk of Husborne Crawley. A detailed critical analysis of Anglicanorum coetibus comes from Australia, where Charles Sherlock has written Pope skips language of love in Anglicans manifesto. What a LAME and embarrassing editorial from the Independent. Whoever wrote it could have said all this about 3 weeks ago. Can’t they get somebody rather more senior and who can move things on rather more than this lamentable 6th form comment? All things to everybody…and saying sweet F A.
Simon Caldwell is much more on the ball…pity they did not ask him to write that editorial. BillyD, I am genuinely curious….how does an Episcopalian cross themselves differently than a Roman Catholic?????? RCs tend to cross themselves forehead, chest, left shoulder, right shoulder. But I was taught in what was then the Diocese of Dallas (and is now Fort Worth) to do it forehead, chest, left shoulder, right shoulder, back to the chest at the end. Hmm… I’ve also seen a distinction in fingers. I was taught index-middle, but I see Roman Catholics using more fingers. Better their open hatred than the sly, backstabbing hatred that’s been shown towards the LGBT community ever since 2003 by Rowan Williams. I have more sympathy for Peter’s honest mistakes or Paul’s well-meaning intransigence than for Judas’s blatant treachery, sealed with a kiss. I don’t know how Rowan Williams can sleep at nights. When I first moved to the Diocese of Texas “Mr.” seemed to be the default title for priests. I was met with puzzlement when I asked the UT chaplain’s secretary if “Fr. Hines” was in. It would be of great benefit to me as a newcomer to locate some sort of compendium or catechism of the official dogmatic statements of the Churches of the Anglican Communion. Can anyone point me in the right direction? Lots of luck on that one. Some might point to the 39 Articles…except that the Episcopal Church in the US, one of the founders of the communion, rejects and/or seriously amends quite a few of those (see the current US BCP). As much as I would like to give ++Rowan the benefit of the doubt, I have to agree with Robin, as his actions speak louder than words. Jeffrey John, the prohibition and non-invite of +Gene Robinson of saying communion and to Lambeth respectively, his interview this week in Rome about the AC not changing it’s stance on LGBT matters and now, his latest foray into co-dependence, the snubbing of a new bishop in Sweden. The man has no guts. BillyD, the southern shore of Lake Erie. JCF, I’m not a Donatist either, although Rowan Williams obviously is because he refused to recognise Gene Robinson either as a bishop or a priest. I don’t for a moment deny Rowan Williams’ orders or the validity of the sacraments he celebrates. It’s just that my contempt for the man’s words and actions on LGBT issues is so great that I couldn’t bear to be in his presence; I would not, as the Prayer Book says, be “in love and charity” with him. Fr Ron, surely “schismatic” action is sometimes a lesser evil than complicity in unrepentant cruelty? I am ashamed to belong to a Communion headed by a man like Rowan Williams, who shows no sign of contrition for the wrong he has done but, instead, continues to propagate homophobia and (in the case of Uganda) condone judicial murder. As I said before, someone like Archbishop Orombi is in my opinion an honest and sincere man, grievously mistaken, whereas Rowan Williams is dishonest, insincere and obviously unrepentant. Fr. Smith-I don’t like attitude at the altar rail than you do, and yes, one shouldn’t succumb to it…but by goodness, can you blame Robin? Thanks, Erika. You say it better *and* more temperately than I could! And, Fr Ron, whether or not Rowan Williams *intends* to propagate homophobia, that IMO is the *effect* of what he’s doing, and effects matter to me much more than intentions. > guiltier than Akinola? really? In my view, yes. Akinola acts and speaks honestly, even though I think he’s mistaken. Well, Robin, not according to the statement just released by the Candanian Anglican House of Bishops, which states that Akinola. Orombi, and others at the 2005 meeting of Bishops at Dromantine all signed an agreement that the *persecution of homosexuals was to be condemned* -Is this not a DIS-honest stance on the part of Akinola and Orombi – whose honesty you here affirm and champion?